We’d love your help. Let us know what’s wrong with this preview of Intellectuals and Society by Thomas Sowell. The influence of intellectuals is not only greater than in previous eras but also takes a very different form from that envisioned by those like Machiavelli and others who have wanted to directly influence rulers. It has not been by shaping the opinions or directing the actions of the holders of power that modern intellectuals have most influenced the course of events, but The influence of intellectuals is not only greater than in previous eras but also takes a very different form from that envisioned by those like Machiavelli and others who have wanted to directly influence rulers. It has not been by shaping the opinions or directing the actions of the holders of power that modern intellectuals have most influenced the course of events, but by shaping public opinion in ways that affect the actions of power holders in democratic societies, whether or not those power holders accept the general vision or the particular policies favored by intellectuals. Even government leaders with disdain or contempt for intellectuals have had to bend to the climate of opinion shaped by those intellectuals. To ask other readers questions about Intellectuals and Society, please sign up. Hayek"intellectual a purveyor of second hand ideas"? “There has probably never been an era in history when intellectuals have played a larger role in society than the era in which we live.” True or not, for Sowell this is not a good thing. According to him “An intellectual’s work begins and ends with ideas.” But since ideas are not facts, intellectuals, particularly ‘public’ intellectuals, often speak unintelligently and when those to whom they speak have power, the rest of us suffer. This widespread lack of intelligence am What Makes You So Smart? The method suggested by Sowell to carry out these empirical tests is basically common sense. At this point he has a problem however. He doesn’t approve of consensus politics as verification of what constitutes reality because “the consensus of the group about a particular new idea depends on what that group already believes in general—and says nothing about the empirical validity of that idea in the external world.” Yet he also doesn’t like ‘experts’ because they may be knowledgeable but lack judgment in a manner typical of all intellectuals. His presumption that there is common agreement about human nature and causation, much less what constitutes factual information is startling but he doesn’t seem to feel the need for its factual confirmation. Sowell provides no solution to this impasse except to say that those carrying out the necessary empirical verification of ideas must be “held accountable”. To whom these researchers should be accountable is not clear. Their disciplinary colleagues are obviously not adequate since they will simply confirm existing biases. The electorate, one presumes, is not competent to make such judgments. By default it appears that some sort of government agency, perhaps a Directorate of Scientific Validity should be established. Stalinist perhaps, but unfortunately necessary. This last remark is transparently sarcastic. But it is difficult to take any other stance toward Sowell’s thought. There are factoids from a wide range of sources, usually intellectuals, strewn about on every page. But these are selected tendentiously to make the point that he already had in mind. Most of the material he presents as supporting his argument is subject to vastly different interpretations than he chooses to give it. One tires quickly from his glib use of ‘notable’ opinions from economists, historians, and social scientists of which he approves and the offhand rejection of others as merely ‘intellectual’. Sowell puts great store in science. But he seems to have little grasp of what constitutes scientific method or the content of discussions carried for centuries about the philosophy of science and the meaning of scientific results. For him scientific verification is presumed casually as a ‘thing’ that is obtainable by some pretty basic, down to earth, kick the tires, type of tests. The intellectual elites make the business of observation, experimentation and fact-checking far more complicated than it is to ensure their control over the process. And, as he has shown, these elites cannot be trusted. Sowell quotes Eric Hoffer approvingly: “One of the surprising privileges of intellectuals is that they are free to be scandalously asinine without harming their reputation.” Indeed this accusation should be directed at Sowell himself. After all, this is a book of ideas condemning books about ideas. It is written by an intellectual who is trashing the work of intellectuals. It is a parody of itself, from its asinine descriptions of those who work with their minds, to the scandal of suggesting that those who do are self-serving con men (and women presumably, but there aren’t many mentioned by Sowell). 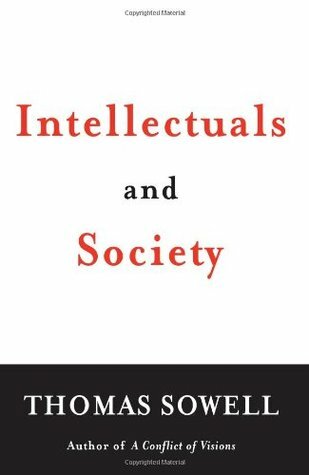 Intellectuals and Society is a polemic - or perhaps, better said, a parody of a polemic - not a serious study in how ideas are generated, or criticised, or get transformed into technology or social policy. It is facile and only superficially erudite. It is meant to play to a crowd that feels that society is on a downhill path and is looking for someone to blame, pillory, and replace. So it fits rather well with the current politics of the Right in the United States. It simultaneously justifies their skepticism about the results of science from climate change to educational curricula, and suggests that they are actually more competent than everyone else thinks they are. More dangerously, It feeds their paranoia as well as their feelings of judgmental competence. Sowell’s brand of political partisanship posing as intellect was described and castigated a century ago by Julien Benda [https://www.goodreads.com/review/show...]. Benda called it treason. I think that’s the correct word. I think it was John dos Passos who said that Americans believe that their neighbors have no right to know more than they do. Intellectuals and Society is a confirmation of that hypothesis. Though I've read a number of excellent new non-fiction releases in the past couple years, this one beats them all. Not only that, it'll likely be the most fascinating, disturbing, and brilliant thing I read all year. Sowell lays out a beautifully researched case for his theme of elitist intellectuals in the West constantly attempting to subvert democracy in favor of oligarchy. Sowell defines intellectuals as professionals who live by ideas, whose end product is abstract and often ideological, and Though I've read a number of excellent new non-fiction releases in the past couple years, this one beats them all. Not only that, it'll likely be the most fascinating, disturbing, and brilliant thing I read all year. Sowell lays out a beautifully researched case for his theme of elitist intellectuals in the West constantly attempting to subvert democracy in favor of oligarchy. Sowell defines intellectuals as professionals who live by ideas, whose end product is abstract and often ideological, and whose notions--whether they are successful or disastrous--are checked neither by the marketplace (as are the activities and notions of the "merchant class"), by elections (as are the ideas of politicians), or by other real-world repercussions (as are the work of scientists, for example). Rather, intellectuals need only continue to maintain the goodwill and indulgence of other intellectuals--that is, their peers in academia, media, and the arts. Sowell supplies numerous examples. Just one is the mathematician Bertrand Russell and his career as public intellectual and pundit for many decades. Russell for a very long time advocated pacifism and was part of the movement toward military disarmament in Britain through the 1930s, stating that if "you are prepared to be defenseless and trust to luck, the other people, having no longer any reason to fear you, will cease to hate you, and will lose all incentive to attack you." Of course it was such notions (Sowell marks a sharp distinction between "notion" and "knowledge") being in vogue right up to the eve of WWII that created much talk about "merchants of death" and the vile "international Bedlam rearmament race" in reaction to Britain's growing but still modest Royal Air Force. Sowell remarks: "We now know that those aircraft and munitions provided the narrow margin by which Britain survived Hilter's aerial onslaught . . . despite a widespread view in 1940 that Britain would not survive." "Either we must have a war against Russia before she has the atom bomb or we will have to lie down and let them govern us. . . . Anything is better than submission." And a decade later Russell was back on the pacifism bandwagon, advocating, if need be, letting the USSR rule the world if it meant preventing a war between nuclear powers. Conclusion? Someone with a healthy attitude toward his own ego would have shut up after the Royal Air Force saved his country from Germany's National Socialist party. This is a strange book. It's an intellectual speaking out against his profession. Sowell defines intellectuals as a people for whom ideas are the beginning and ending of their work. Tenured professors are the most ready example, but intellectuals can also be found outside academia. For example authors, commentators and public speakers who are paid to continue producing ideas. The key is that intellectuals need only continue to attract an audience for their ideas in order to remain relevant. This This is a strange book. It's an intellectual speaking out against his profession. Sowell defines intellectuals as a people for whom ideas are the beginning and ending of their work. Tenured professors are the most ready example, but intellectuals can also be found outside academia. For example authors, commentators and public speakers who are paid to continue producing ideas. The key is that intellectuals need only continue to attract an audience for their ideas in order to remain relevant. This reliance on ideas insulates intellectuals in a way that is uncommon in almost any other profession, they are relieved of accountability. Intellectuals can be, and often are, completely wrong and, as long as they can maintain their audience, they are insulated from the negative consequences of their ideas. Intellectuals and Society is about the sources and rationalization of the ideas of intellectuals, the way their ideas are propagated, why they are so often wrong, and the effects of the ideas on the world. Sowell is a conservative and, not unexpectedly, his targets are liberals like Bertrand Russell, Noam Chomsky, Edmund Wilson, George Bernard Shaw, John Dewey and others. It may seem like an arbitrary or biased selection, but the reason for the focus on liberals comes down to a fundamental difference between liberalism and conservatism. Despite the popular assumption that conservatives only want the status quo, both conservatives and liberals want change. The difference lies in the types of change each wants. Liberals favor change that centralizes and idealizes decision making and power while conservatives seek the type of change that distributes power and that values tradition over ideology. Liberals often assume that an individual or small group, knows better than the masses. First-hand experiences succumbs to prevailing notions. A concentration of knowledge is seen as being superior to distributed knowledge. Reason trumps experience. One-day-at-a-time rationalization wins over long-term and big picture thinking. Mundane knowledge is shunned for the specialized knowledge of elites. Sowell calls this the vision of the anointed. I started this hoping that it would be a bit like Scott's _Seeing Like A State_, which is one of my favorite books, or if not exactly like that, at least like something Charles Murray, who is one of my favorite writers, might have written on the topic. I was quickly disabused of both hopes. Sowell is not that great a prose stylist and has a gift for putting things in ways that irritate the hell out of me even when I already agree with him. More importantly, the promise of the flaps and introductio I started this hoping that it would be a bit like Scott's _Seeing Like A State_, which is one of my favorite books, or if not exactly like that, at least like something Charles Murray, who is one of my favorite writers, might have written on the topic. More importantly, the promise of the flaps and introduction is *not* borne out as far as I read. It was not an investigation, either psychological or historical or economic, of intellectuals or recent intellectual history. It was simply a partisan rant bringing up all the old arguments and citations we've seen a million times before; I give him points for thorough - dare I say, intellectual - sourcing, which is more than one can say about eg. Michael Moore or Ann Coulter's books (he wrote, damning with faint praise). There are arguments in it which I find hard to believe would pass Sowell's own muster if they were dressed up in liberal guise. For example, on pg27 I was shocked to see - in the middle of his haranguing liberals for insufficient attention to economics - him *seriously* argue that oil company executive salaries are irrelevant because they add only a dime to the cost of gasoline gallons! Wow! Imagine Sowell's reaction to the following argument: "regulation XYZ is not worth debating about because, after all, when implemented it will add no more than a dime to the cost of gas" - can there be any doubt that he would rip this argument to little eeny-weeny shreds for failing to 'think on the margin' and realize that an extra dime will make or break many economic decisions and ramify throughout the economy? How was it possible for him to write such a transparently partisan thing? Because it was a good bash at his enemies. It came as no surprise on pg28 to see a caricature of economic libertarianism and zero mentions of standing disproofs of the simplistic models like Coase's point about large firms being economic absurdities and central planning in a different disguise, since I wasn't expecting very much any more. By pg30, I abandoned my sporadic note-taking and began playing a little game: write down every time a thinker or politician who could be described as conservative or libertarian is criticized or given as an example of the evils of intellectualism. Naturally, I didn't expect to see Hayek come up for hobnobbing with dictatorships (any more than people discussing Mother Theresa usually bring up her more questionable funding sources), but still - an entire book ought to provide at least 1 or 2 examples. In the 70s or 80s, I thought I might *finally* have something to add to my list: Naziism and Italian fascism. Surely those would get criticized, as they notoriously aimed to remake their entire societies, with disastrous results? But no! I learned, to my surprise, apparently fascism and Naziism are socialist liberal parties and they are just more liberal examples of intellectual arrogance! Apparently no one on the right end of the political spectrum has ever proposed or implemented any bad idea, ever. Even if I granted the fairness and accuracy of all his descriptions of left-wingers, his conclusions or synthesis would be completely worthless as it omits half the political spectrum! It would be like doing a study of cancer patients and throwing out every patient who was a Democrat - what could you possibly hope to learn at the en, after you did that? The Naziism-is-socialism finally broke me. Writing a bad review is not so worthwhile as to be worth going through this. The book was nothing but capsule hitjobs of everyone Sowell disliked at any point, and gave no indication that it would be anything but that for the entire rest of the book. The people who have reviewed this book negatively either A) have never read it, or B) are uncomfortable with the truths they have discovered. The key to understanding what Thomas Sowell means when he talks about intellectuals is that intellectuals are not simply "thinking people." Intellectuals are people whose *end product* is simply an idea, and this idea is not subject to traditional real-world validation processes, but is subjected to the weaker form of validation known as peer review. Why i The people who have reviewed this book negatively either A) have never read it, or B) are uncomfortable with the truths they have discovered. The key to understanding what Thomas Sowell means when he talks about intellectuals is that intellectuals are not simply "thinking people." Intellectuals are people whose *end product* is simply an idea, and this idea is not subject to traditional real-world validation processes, but is subjected to the weaker form of validation known as peer review. Why is this important? Einstein's peers in academia might have bashed some of his scientific theories, but history proved that Einstein's theories were more than just *his* theories when the first atomic bomb went off. Engineers' designs are put to the test every day. An auto mechanic's repair practices are validated daily as well. Every time an airline cuts ticket prices and more people buy tickets, theories about price elasticity are validated. Academics who pontificate over supposed societal wrongs and how to fix them, however, are not subjected to this same type of validation. In this sense, intellectuals operate in a dangerous world where they can be extremely wrong on a variety of matters, but since an echo chamber usually emerges from their typically like-minded peers, these wrongs are not discovered until they have already caused societal damage. Furthermore, intellectuals have a natural set of incentives that causes them to make controversial statements, because no academic ever became famous or achieved stardom from simply agreeing with everyone else. The fatal flaw most intellectuals make is the subtle play where they hope that since you know they are an expert in an extremely narrow field that they must be an expert as well in all kinds of adjacent fields (which they are clearly not). Ultimately, things that improve over time tend to have a good feedback mechanism. That's why private companies tend to perform much better than government services. If a private company is not satisfying its target consumers, it sees that impact immediately in the form of quick feedback: loss of profit. Government agencies, like intellectuals, do not see this kind of quick feedback mechanism, allowing them to operate in an undesirable manner for far longer than a private company would be able. The title of this work, and the thrust of its argument, may initially deceive. It is not a critique of the mind or of intellectual pursuits. It is rather a critique of the god-like mentality many intellectuals assume, wreaking social havoc in their arrogant presumption of knowledge. By "intellectuals," Thomas Sowell means those professional thinkers whose end products are ideas, as distinguised from the end products of other professional thinkers like architects or engineers. Intellectuals and S The title of this work, and the thrust of its argument, may initially deceive. It is not a critique of the mind or of intellectual pursuits. It is rather a critique of the god-like mentality many intellectuals assume, wreaking social havoc in their arrogant presumption of knowledge. By "intellectuals," Thomas Sowell means those professional thinkers whose end products are ideas, as distinguised from the end products of other professional thinkers like architects or engineers. Intellectuals and Society is vintage Sowell and contains his usual brilliant insights on the economy, yet he discusses far more than just economic concerns. The book takes a broader arc and deals more generally with the application and centralized enforcement of untested ideas. Sowell reminds us that ideas have consequences, and ideas spawned from intellectual hubris often have disastrous ones, especially when implemented in a universal manner. He also stresses a rather obvious, yet often ignored, fact--to wit, that even the smartest or wisest of men is ignorant on most subjects. Moreover, an isolated genius cannot serve as substitute for the accumlated wisdom of millions. My one critique would be Sowell's section on war and foreign policy. Pointing out the error of intellectuals prior to World War 2--he critiques those who cried for peace when there was none to be had--Sowell seems to make the opposite mistake, assuming that nations must therefore always take an agressive posture in their foreign relations. This seemed too broad a prescription based on too small a body of evidence. Regardless, even in this section, Sowell has many insightful nuggets, and his historical commentary is quite thoughtful. -Sowell says that these intellectuals are "not accountable" for they propose or advocate. Well, neither are many OTHER folks in our society. (For-profit) doctors and hospitals for medical errors and wrongful deaths, Big Pharma for the very same reasons, accountants, CEOs and boards of directors for their company's profit-losses and/or stock collapse, big-money lawyers who sue without merit, etc., etc..
-Sowell asks who the "robber barons" stole from, back in the 1800 and 1900s. How about the taxpayer - who paid for SUBSIDIES that went right into the rich-man's pockets. -He mentions how the Ford Motor co. paid their employees well. Ya, 100 years ago ! How about since 1970 - where (national) wages have fallen 15%, adjusted for inflation. And this, in the age of RECORD corporate profits. -Throughout the book, Sowell (very carefully) doesn't mention the failed CONSERVATIVE intelligentsia. From Milton Friedman's market philosophies - being a big cause of the depression we're in now, to tax cuts "stimulating business investment", these ideas have been *disastrously* wrong...and have done great harm to our nation. -Also, the for-profit "medical" intelligentsia - pushing for many tests, procedures and surgeries that have proven to be in-effective. Government simply goes along with what they want - they are the "experts", after all. But their ideas and theories have subsequently bankrupted our nation and contributed to what is likely the largest cause of death in the U.S. - the U.S. health care system. -Sowell defends monopolies. Sure, they're not *all* bad...but too many are. From no-competition cable TV to Microsoft Windows to Frito-Lay, they routinely rip-off the American consumer. Or sell them low quality products. Take Frito-Lay - they don't have to make a good potato chip, since they control the market. So they make (cheap) chips that break. I get through about half a bag before I have to throw it out. -On gun rights, the author attacks liberals for advocating gun-control. This would have been a problem if they succeeded. BUT THEY DIDN'T: 35-40% of American homes contain a gun and there's no end in sight. -Sowell attacks environmentalists for driving-up home prices. Maybe they did a little. But it's not even CLOSE to what *free-market* intelligentsia have done to home prices, since the 1990's !! Whether "securitizing" mortgage debt, removing capital-gains taxes on houses (causing "flipping"), lowering standards of risk assessment for home buyers, rubber-stamping bonds (from for-profit rating agencies), etc, etc. These forces did FAR more damage than any environmentalist could hope to do. We can't even blame the CRA of 1977 - proven to be a false reason for the housing bubble-crash. -We also can't blame environmentalists for the Gulf Oil Spill. Big Oil was drilling offshore well before environmental laws kicked-in. But I'm sure Sowell tried to pull a fast-one here as well. Интелектуалците са хората, чийто начален и краен продукт са идеи - идеи, които нямат връзка с практиката и за своята оценка зависят не от обективни критерии, а само от мнението на други интелектуалци. Такива области са философията, литературата (и изкуството като цяло), социологията, политологията и др. Най-характерното за хората с тези професии е, че като цяло тяхната дейност няма никакъв практически измерител. За разлика от другите професии на ума (инженери, лекари, учени, програмисти, дизайне Интелектуалците са хората, чийто начален и краен продукт са идеи - идеи, които нямат връзка с практиката и за своята оценка зависят не от обективни критерии, а само от мнението на други интелектуалци. Такива области са философията, литературата (и изкуството като цяло), социологията, политологията и др. Най-характерното за хората с тези професии е, че като цяло тяхната дейност няма никакъв практически измерител. За разлика от другите професии на ума (инженери, лекари, учени, програмисти, дизайнери) - дали си, примерно, голям философ или социолог не може да се измери или изчисли в някакви парични или материални резултати (излекувани пациенти, построени сгради, спечелени пари) - то се определя само и единствено от мнението на други философи или социолози. Според Т.Солуел, тези хора определят обществения и политически идеен климат на нашето общество. Но тъй като действителността не им действа като спирачка (те работят само в мисълта си), творейки идеи за обществения и политически живот, те започват да приемат желаното от тях за факт, а предположенията си - за истина, пренебрегвайки реалността. Политиките и идеите, които те проповядват всъщност често противоречат на всякакви доказателства, а често и на здравия разум, но чрез ораторско майсторство и от позицията си на интелектуални стожери, те успяват да ги оправдаят пред колегите си интелектуалци и последователите си от интелигенцията и да задават курса на развитие на обществените настроения и политики. Така например фактът, че щедрите социални програми поощряват много хора да не работят, няма значение за интелектуалците - тяхната идея, че тези програми "помагат на бедните" и идеята за "социална справедливост" са по-важни от действителността, която създават. Същото е и с "мултикултурното общество" - за интелектуалците идеята, че трябва да приемаме и поощряваме другите култури е по-важна от факта, че е откровено глупаво да поощряваш някой, който откровено не те харесва. Примерите са много - международното разоражаване създавало мира, въпреки, че така разоражени остават само тези, които искат мир, но не и тези, които планират война - забраната на личното оръжие намалявала престъпленията, въпреки че ако оръжието е незаконно, ще го имат само хората извън закона ... и т.н. Накратко - левите идеи са продиктувани от това, че създателите им, основно интелектуалци, пренебрегват реалността и я заменят с това какво трябва да бъде и как нещата стават според техните фантазии. Това описва подробно Соуел в книгата си, давайки десетки примери, обяснявайки причините. This recently published book (2010) makes a very thorough case against government action of most any kind, with the exception of war. I spent over an hour looking through Sowell's latest book at Borders. The blurb inside the jacket caught my attention because it mentioned how intellectuals influence our democratic process by shaping the thinking of the electorate, rather than directly persuading elected officials. I saw this as a significant insight into how our system works. I extend the theory This recently published book (2010) makes a very thorough case against government action of most any kind, with the exception of war. I spent over an hour looking through Sowell's latest book at Borders. The blurb inside the jacket caught my attention because it mentioned how intellectuals influence our democratic process by shaping the thinking of the electorate, rather than directly persuading elected officials. I saw this as a significant insight into how our system works. I extend the theory to any media person with a large audience, the impact of their ideas is greatly amplified. Rush Limbaugh could be an example. A good communicator with a big audience has diproportionately expanded political speech, similar to the expansion of speech rights for corporations under the new Supreme Court ruling. I would argue that the media figure actually has greater power than the corporation. Remember the clashes between GOP chairman Michael Steele and Rush Limbaugh over which of them speaks for the Republican Party? We have all understood how big business and lobbyists are dominating our political debate and many of us see this as very bad for our nation. But I haven't heard much discussion about the great influence of the very small minority of opinion shapers. So I was disappointed to see that Sowell turned from what could have been a full analysis of this phenomenon and instead chose to pursue a one-sided attack on government. That said, he makes some very good points that should give pause to anyone attempting to govern. There is no question that history is full of examples of unintended consequences, government actions that backfire and make the situation worse, and "public intellectuals" being proven totally wrong by unfolding events. Sowell lists these out with relish. It is a truth that we cannot generally see weaknesses in our own beliefs. People with different convictions are only too happy to point these out, and we can learn from them. Sowell is not immune to this, he sees none of the failings of his own hands-off dogma. I will point these out and show that his overall conclusions are incorrect even though much of what he says is true. One of the main arguments of "Intellectuals and Society" is that there is far more intelligence distributed among the many actors in the market than can be contained in a small group of experts. This makes sense in a certain way, and is really just a restatement of the Adam Smith's invisible hand. Yet we have an example right before us in recent history where the invisible hand guided market players to make extremely risky loans against no collateral. I have heard Wall Street experts describe how in this climate even prudent managers were basically forced to participate because if they didn't they would be outperformed in the short term by those who did, due to the bubble economics at play. In fact, any bet against the bubble would be impossible to collect, since if you were right then the counterparty to the bet was bankrupt. So experts may frequently be wrong, but the market can also be "wrong", or at least lead us somewhere we don't want to go. When experts attempt to tinker with complex systems they can easily cause big problems, sometimes bigger than the problem they're trying to solve. Sowell uses this to argue against intervening in the system. Taken to the extreme, this means essentially no government. But what is government other than a very greatly expanded version of a group of people combining forces for greater efficiency? If a neighborhood gets together and decides to take care of their own garbage service to save money, this takes some organization, a group decision, and a willingness to abide by that decision. We accept leadership and top-down decisions in the corporate structure (and all of us who have worked in this environment know how disconnected from day-to-day reality these can sometimes be). Yet corporations can have great success being guided by an elite at the top. Believe me, I'm very much in favor of keeping things simple and keeping an organization lean and small. But does that mean that you should forgo any consolidation of forces to protect individual freedom? This is the trade-off. If you never want someone to tell you what to do, then you are reduced to a lone-wolf status, with no benefit from others resources or know-how. I am arguing that good government may sometimes tell you what to do, but you are getting a great benefit from its efficiencies and combined resources. (I know the idea of efficiencies and government in the same sentence seems ridiculous, but bear in mind that we have a huge country here and so obviously there is a fair degree of waste in this process when you consider the many levels of government involved). This book is so poor that it is hard to keep a straight face when discussing it. For the better part it sounds like a 'rant' against 'smart people who assume too much' on the part of the author. Mixing wild examples, assumptions and generalizations on the basis of limited experiences, the author vents his frustration. Just to make it worse the author does not make a critique of intellectuals in general, just of those who are 'liberal', 'left', etc. There are intellectuals, who are bad, and preside This book is so poor that it is hard to keep a straight face when discussing it. Just to make it worse the author does not make a critique of intellectuals in general, just of those who are 'liberal', 'left', etc. There are intellectuals, who are bad, and presidents, economists, etc. who are good. John Kenneth Galbraith is a bad intellectual, Prof. Milton Friedman is an enlightened economist. This is a fascinating idea: a study upon the nature and influence of intellectuals themselves upon society. What more appropriate group for study than the people dedicated to study? Many people have described the nature of academia, or the processes of research and development in American life, but as far as I know, nobody has turned the spotlight on intellectuals as a group. That lack means that such an analysis is not only warranted, but even needful. Unfortunately, Sowell fails in this analysi This is a fascinating idea: a study upon the nature and influence of intellectuals themselves upon society. What more appropriate group for study than the people dedicated to study? Many people have described the nature of academia, or the processes of research and development in American life, but as far as I know, nobody has turned the spotlight on intellectuals as a group. That lack means that such an analysis is not only warranted, but even needful. Unfortunately, Sowell fails in this analysis on every meaningful level. In describing the errors of what he deems to be the intellectuals of American society he makes several fundamental errors that fatally doom this effort to describe the processes of intellect, and he does so in ways that should have been obvious to anyone before they sat down to write. In brief, in his criticism of intellectuals in American culture, Sowell commits—almost systematically—every error of logic, shallow misinterpretation and sin of omission that he accuses his subjects of performing. In many cases he commits the error he is describing an intellectual of committing AS HE IS DESCRIBING IT. He does so without any apparent recognition of his own participation in the exact same processes in a way that must be recognized as irretrievably hypocritical if not pathetically naïve. I can't fully address the fallacious errors of this book because it is so rife with them that doing so would require a similarly lengthy text. Let’s just say that the logical errors are so fundamental, and Sowell’s embracing of them so complete, that they appear on nearly every single page, in every example, and in his every argument. Intellect is not intelligence less judgment. Judgment is part of understanding. You can no more divorce judgment from intellect than you can remove knowledge, thought or comprehension. One of the reasons we do not have an artificial intelligence is that we have been unable to develop a machine with judgment. Machines can rate, value and compare, but they do not judge. That’s what an intellectual does. Sowell’s definition “intelligence minus judgment” describes a machine, not an intellect. Unfortunately, Sowell then goes on to further lobotomize the definition by casting it across society so broadly as to make it a meaningless standard. His examples are drawn from the halls of academia to be sure, but he also includes editorialists, journalists, playwrights, psychologists, politicians (notably some who were anti-intellectual) religious leaders, doctors and a range of industrialists. Now, it is certainly true that there are intellectuals amongst any or all of those groups of people, but what Sowell does in lumping them together so haphazardly is create a pool of intellectuals and—at best—non-intellectuals from whom he can draw his examples. He then picks and chooses amongst them to make his case. In doing so, he seems to have redefined “intellectual” to mean “anyone with a public voice” no matter where that voice comes from, nor how it is expressed. Furthermore, according to Sowell, intellectuals cannot be people who go about actually implementing the fruits of their ideas. They are not “policy wonks” or social engineers. They leave such things to others. Specifically mentioned, therefore, as NOT intellectuals are people like Jonas Salk and Bill Gates, whose mental efforts actually produced something that changed society directly. Intellect, it seems, is intelligence less judgment, action AND success. I suppose if one really wants to parse the concept down, one could exclude Bill Gates from the concept of intellectuals on the basis of the relative newness and specificity of his intellectual efforts on a global and historical scale. It would be an error to do so, but it’s a comprehensible one. However, I defy anyone to reasonably describe Jonas Salk as not an intellectual. Sowell had to turn a particularly strange and elaborate backflip in order to justify that one. In short, Sowell defines intellect as anybody he deems foolish, ineffectual or shallow, and whose efforts have had no meaningful influence on society. This failure of comprehension permeates the entire book, and Sowell goes into rhapsodic fallacious detail in describing the common errors of human beings as the faults of intellectuals. In short, at all levels of the intelligentsia, and in a wide range of specialties, the incentives tend to reward going beyond whatever expertise the particular member of the intelligentsia may have, and the constraints against falsity are few or non-existent. It is not that most of the intelligentsia deliberately lie in a cynical attempt to gain notoriety or to advance themselves or their cause in other ways. However, the general ability of people to rationalize to themselves, as well as to others, is certainly not lacking among the intelligentsia. Here we again run into one of the constant logical loops that Sewell completely fails to acknowledge or, apparently, to recognize. He could very well be talking about himself in that paragraph. In fact, he *is* talking about himself. Sowell is trained as an economist. He’s written books on social theory and commentary, but his authority to do so is derived through his education and his experience as a pundit, not his expertise. Furthermore, what he attributes to the intelligentsia is, in fact, simply part of the human condition. Everyone acts outside their specialties, and we are all incentivized to do so. Not to do so is to deny a fundamental human quality. Specialization has a role, but to only act within that specialization is to reject intelligence itself. Where Sowell’s efforts to describe a social phenomenon don’t simply fail but become truly offensive is in his presentation of other's ideas. Sowell either misrepresents the ideas that other scholars have presented or fails to comprehend them so badly as to make himself a fool exactly of the kind he is attempting to critique. I’ll give two examples, just to illustrate the point. ...many of the intelligentsia express not only surprise but outrage at the number of shots fired by the police in some confrontation with a criminal, even if many of these intellectuals have never fired a gun in their lives, much less faced life-and-death dangers requiring split-second decisions. Now, here Sowell draws upon and stumbles over his experience as a pistol instructor for the Marine Corps. (This is the kind of error he attributes to many intellectuals early in the book.) The problem is that Sowell’s military experience has nothing to do with the objection, and his apparent inability to see past that training makes his assessment a problem. What he fails to recognize is that the nameless intellectuals (he avoids referencing anyone or a particular case on this issue--though it would have been much easier to do so than nearly any other example he cites--since the logic here gets quite shaky) he describes are not objecting to the actual number of shots fired alone. Intellectuals, in fact, understand not only the rate of fire of modern weapons but also their accuracy—just as most Americans, or anyone with a television, is capable of grasping that simple and obvious reality, regardless of their status as a combat veteran. When someone objects to the number of shots fired in a particular case it is done when there is also a contrast between that reaction and the situation with which the police officer was confronted. When it turns out the suspect was not armed, did not make any threatening move, was detained without proper cause, or was otherwise not an appropriate target of police fire at all. When a policing situation goes so far as to require a military style response, intellectuals are perfectly capable of understanding and recognizing that transition. No intellectual objected to the number of shots fired in taking down the Boston bombers, who were themselves armed with firearms and explosives. Intellectuals do not object to the more then 2,000 shots fired in the North Hollywood shootout in and of itself, though someone (including, say, a police officer reviewing the situation and preparing a report on it to his department) could quite legitimately ask why those robbers had 44 minutes to engage the police, thus allowing for such a long exchange AND so many shots fired. When intellectuals object to the number of shots fired in a particular situation, they are pointing out that the transition between an everyday policing problem and the more military role of the police in suppressing violence has been blurred or bypassed. They are pointing out that shots should not have been fired at all, let alone dozens or sometimes hundreds of them. That Sowell is unable to recognize this objection for what it is, and must instead cite statistics about the number of hits at a particular range, illustrates his failure to comprehend even the most obvious of intellectual statements. In fact, all the Americans killed in the two Iraq wars put together were fewer than those killed taking the one island of Iwo Jima during the Second world War or one day [emphasis included] of fighting at Antietam during the Civil War. I’m not going to describe why that bloody accounting is offensive, and if you need an explanation you’ll not be capable of understanding it, so let’s just leave it at this: comparing the casualties in wars for survival to the American involvement in Iraq is not to slip off the slope, but to leap from it. I’ll conclude on this note: Where Sowell goes to some pains to explain that many of the people he describes as intellectuals are not engaging in their efforts cynically, having read this book I have no such expectation of Sowell. In fact, the only justification for this book that I can see is that it is as a resume. It is filled with so many errors of logic and assertion that it can only be a curriculum vitae for someone seeking grant money from think tanks funded by deep pockets. These organizations are actively and constantly seeking justification and arguments for the money they spend on political support. This book is a play for some of that funding, and the high-paying speaking engagements that go with it. It has no real value other than to outline the script for buyers of such a product. Nobody should bother attending such a lecture any more than they should bother with this book. It’s not, in fact, about intellectuals at all. It wasn’t written by one. It doesn’t serve any meaningful or worthwhile purpose other, perhaps, as an illustration of the lengths and breadths of mental hypocrisy and narcissism. "One of the surprising privileges of intellectuals is that they are free to be scandalously asinine without harming their reputation. The intellectuals who idolized Stalin while he was purging millions and stifling the least stirring of freedom have not been discredited. They are still holding forth on every topic under the sun and are listened to with deference. Sartre returned in 1939 from Germany, where he studied philosophy, and told the world that there was little to choose between Hitler's Germany and France. Yet Sartre went on to become an intellectual pope revered by the educated in every land." -- Eric Hoffer, "Before the Sabbath"
Here is the main premise put forth by Dr. Sowell. We all possess knowledge, all 350 million of us. If you take all the intellectuals in Washington, they can't possibly possess even 1% of that knowledge. So how is it that we will all be better off by letting the people with 1% of the knowledge tell the people with 99% of the knowledge what to do? "If no one has even one percent of the knowledge currently available, not counting the vast amounts of knowledge yet to be discovered, the imposition from the top down of the notions in favor among elites, convinced of their own superior knowledge and virtue, is a formula for disaster." A terrible and poorly argued book. I didn't know who Sowell was when I picked it up but I certainly won't be reading anything else by him. A common approach of his is to define a term, make grandiose and universal claims about it, no-true-scotsman any obvious exceptions (he'll often have one word for the "good" version of something and another for the "bad" as if they were fundamentally different things - what's the difference? Apparently, whether or not they agree with his politics), then make a A terrible and poorly argued book. I didn't know who Sowell was when I picked it up but I certainly won't be reading anything else by him. A friend of mine recommanded this book to me during this 2016 Presidential Election. Given the result is that Trump won, I think I shall recommand the book to all people I know, especially professors, students, media professionals, etc. It's time to rethink something. I love books that address the problem of "experts" and elitist thinking that filters down to the mainstream. So, I was sure I would love this book. However, the arguments presented by Sowell were so poorly constructed and had such gaping holes, there was no point to finishing this book. The good points were constantly lost and muddied in the mire of bad arguments. Tricky to rate. I'll go with 4/5 because some parts (on class and race) are excellent, including the counter-arguments to the infamous observations on race and IQ in The Bell Curve: Intelligence and Class Structure in American Life. Despite too many less-than-stellar chapters, I found this door-stopper worth the time. There seems to be a bit of a mean streak in his writing, but Thomas Sowell is still one of my favorite contemporary thinkers. I need to preface this by saying that I am a big fan of Sowell's works. But at this point I believe he has been over-published, and much of his work is now repetitive. Intellectuals and Society bears too much similarity to previous works of his such as A Conflict of Visions, and those works are shorter, which means that much of this work will be a waste of time. Most of the content is superb. Some of his examples of where intellectuals attempt to make pretentious and dubious claims to the right t I need to preface this by saying that I am a big fan of Sowell's works. But at this point I believe he has been over-published, and much of his work is now repetitive. Intellectuals and Society bears too much similarity to previous works of his such as A Conflict of Visions, and those works are shorter, which means that much of this work will be a waste of time. Most of the content is superb. Some of his examples of where intellectuals attempt to make pretentious and dubious claims to the right to impose their vision on others best be noted; Sowell is no doubt right in much of what he says. There are a few places where what is written is questionable, however, as in Sowell's chapters on intellectuals and the law. One almost senses that he would do away with the concept of judicial review altogether, arguing that it is unconstitutional (in theory this is true, since there is no mention in the constitution of this as the role of the courts, but few people really question john Marshall's assertion of judicial review as the court's prerogative starting with Marbury v. Madison). While there is good value in rejecting judicial activism, I feel that Sowell does not make a careful distinction between the two, which may have provided this book with a fresher approach than some of his previous work. Additionally, Sowell repeats himself over and over again, so the book at 540-some-odd pages appears as though it could have been written with more impact at no more than and possibly substantially less than 400 pages. There is nothing so insulting to a reader--or which wastes so much of a reader's time, which is his greatest asset--as redundancy. Ultimately that is my biggest problem with this work. Lies My Teacher Told me blows away kids in high school. This book does the same but for college graduates. Holy crap I feel lied to! What an incredible read! I don't want to pretend like this book is perfect though. Sowell has a much better grasp of how politics, economics, and history are "spun" than he does art or fiction or stories in general. Sowell would greatly benefit from reading Hero With a Thousand Faces, Deschooling Society, and The Romantic Manifesto, among other things. I like Sowell in small doses as he typically has interesting and uncommon views - some of with which I agree. But this book is 600 pages of unabashedly biased double-speak. It's a political hit job masquerading as a quasi-academic discussion of "intellectuals" which Sowell makes only the slightest attempt to hide his real definition as "liberals I disagree with." It is always difficult, if not impossible, to foretell what books will still be read generations from now. If I had to bet, I would bet that this book will be among them. I am not sure if I enjoyed it quite as much as the Vision series, but it is close. Dr. Sowell believes it is his most important work. A reader is always a little wiser after having read the works from this great scholar. Sowell's thesis is simple and clearly stated: intellectual elites and experts are not to be blindly trusted. Nassim Nicholas Taleb has said much the same thing in his works while avoiding Sowell's blunt and politically incorrect implications. That an intellectual can criticize other intellectuals without offering a prescriptive way out of an imagined "impasse," as one perplexed reviewer opined, is hardly a disqualifying conundrum. No one criticized Aristophanes for lampooning Socrates and the in Sowell's thesis is simple and clearly stated: intellectual elites and experts are not to be blindly trusted. Nassim Nicholas Taleb has said much the same thing in his works while avoiding Sowell's blunt and politically incorrect implications. That an intellectual can criticize other intellectuals without offering a prescriptive way out of an imagined "impasse," as one perplexed reviewer opined, is hardly a disqualifying conundrum. No one criticized Aristophanes for lampooning Socrates and the intellectual class of ancient Athens when he wrote The Clouds 2,500 years ago. The question Sowell poses can be summarized by reference to Sidney Hook who allegedly asked Albert Einstein: "I don't lecture you about physics; why to you lecture me about politics?" That's the point of Intellectuals and Society. Sowell takes the pronunciamentos of the high and mighty, the great and gifted, and scrutinizes them against outcomes. In chapter after chapter on issues ranging from inner city crime, to economics, to international security, he uses this method to measure stated goals with actual results. This method is hardly unusual in scholarly circles. Although trained as a quantitative economist, Sowell uses well-established ethnographic and comparative interpretations to arrive at his conclusions. In the end, he makes a convincing case that his theory (borrowed from Hayek) of expert knowledge (deep and narrow) versus accumulated common knowledge (broad, and nuanced) has validity. Given that social action is inherently complex, dynamic, and virtually limitless in its permutations, the book demonstrates the risks of expert knowledge. Where Sowell, in my opinion, slips is in his analysis of war and international security situations. Here, the role of deception and misperception often influence outcomes and even copious amounts of post hoc research may only produce more questions and uncover more enigmas. Thus, Sowell's narrative of Germany after World War I is conventional and predictable while scholars such as Gerhard Weinberg have themselves challenged this view for years by, among other things, claiming that Germany got off relatively lightly at Versailles and not, as received opinion holds, that Versailles punitive terms played a significant role in the run up to World War Two. Such a strange book. I went in knowing that the author was a conservative economist, and I chose this book because it was his most recent publication that I could easily get my hands on. The author starts off by denouncing “intellectuals” for pontificating outside their areas of expertise. Then he proceeds to present himself as somehow expert in fields as diverse as sociology, constitutional law, theology, military history, political theory, philosophy, hermeneutics, and art criticism. I’m not an Such a strange book. I went in knowing that the author was a conservative economist, and I chose this book because it was his most recent publication that I could easily get my hands on. I guess people either love or hate this book. It may be because it come down pretty hard on "Left" Intellectuals. The book doesn't start this way. In fact the author does a nice job of constructing his arguments and definitions so that there is no confusion what he means when he references something like an "intellectual" or "knowledge." Some of the reading can be difficult, but in general the author tries to make this accessible to a larger audience. He himself points out the difficulty of comm I guess people either love or hate this book. It may be because it come down pretty hard on "Left" Intellectuals. The book doesn't start this way. In fact the author does a nice job of constructing his arguments and definitions so that there is no confusion what he means when he references something like an "intellectual" or "knowledge." Some of the reading can be difficult, but in general the author tries to make this accessible to a larger audience. He himself points out the difficulty of communicating in various styles for different audiences, and how only some of the best are able to communicate in such a fashion. So, not bad for an economics professor/writer. Intellectuals: Those who produce solely ideas, as well as those who disseminate and build upon those ideas. These people often have limited personal consequences for ideas they espouse and are incentivized to think along the same lines as their peers (those who validate their works/ideas). They are also incentivized to go beyond their field/knowledge in order to gain acclaim and money. Knowledge: This is more than just books, but includes the "mundane" knowledge held and passed down by millions of individuals. It includes wisdom/experience, and dwarfs the cumulative knowledge held by intellectuals. The Anointed: Intellectuals tend to consider themselves as elite and believe they can guide society to a better or proper place. Their arrogance causes them to believe their knowledge is sufficient to do this, and they thus advance their solutions. Generally such solutions involve increased government (and control by the intellectuals), regardless of the consequences or net benefits of these "solutions." Their views are religiously expounded and defended. Such viewpoints see them as being on a higher moral plane than others, thus enabling intellectuals to trample laws and traditions in order to bring about their views (to benefit others and elevate themselves). The Vision: Intellectuals tend to see themselves as the "anointed" ones who will lead those below them to a better life. Any problems in the world are viewed as something that is caused by, and can be fixed by, institutions. By contrast, the opposing view sees Man in a Fallen State. In this contrasting view, there will always be problems in life and it is a matter of balancing imperfections. Those are the main constructs of Sowell's argument. He then moves into demonstrating that intellectuals lack a clear understanding of economics, crime/punishment, and war. Rather than a true intellectual debate, they tend to simply advance their ideas as true, and discredit those they do not agree with. The book gives a nice broad summary, but also gives good illustrative examples throughout.